Book # 4 is out! Happy June, all! 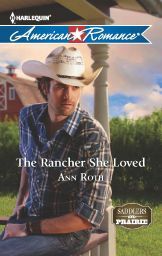 To kick off the month, The Rancher She Loved, book #4 of my Saddlers Prairie miniseries is out today. Yay! I enjoyed writing this book. Sarah Tigarden is on a a quest to find her roots, a search that leads her to Saddlers Prairie. Clay Hollyer is a bull rider at the top of his game. Or he was until everything changed. Now he’s reinventing himself in Saddlers Prairie. That’s all I’m going to share about Sarah and Clay. To find out more, read the book. 🙂 It’s a great summer read. You’ll find a link to purchase on the home page of my website. www.annroth.net. 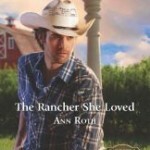 I’d love to hear what you think of The Rancher She Loved. Thank you so much for the great review! You made my day. Yes, there will be one more book in the series, a Christmas story that comes out in, of all things, October. Let me know what you think of those cookies. If you’re like me, you’ll love them!